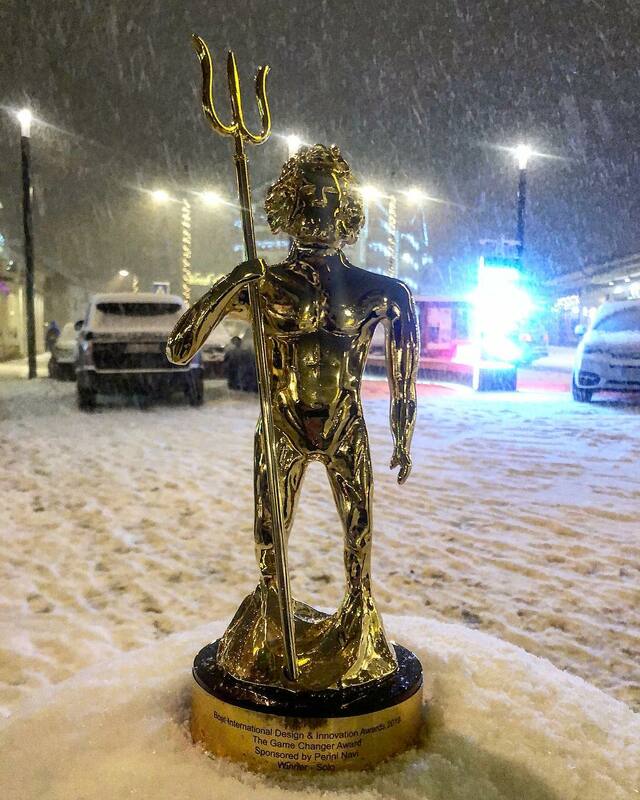 The Gala party took place on January 27th, in Cortina D’Ampezzo; the panel selected the winners in each category by assessing design, style and on-board comfort, taking into account technological and design innovation. Eight of the 21 given awards, were assigned to Italian shiyard or designer. Last, but not least, the Young designer of the year award was assigned to a Taiwanese who is studying at the Politecnico di Milano. 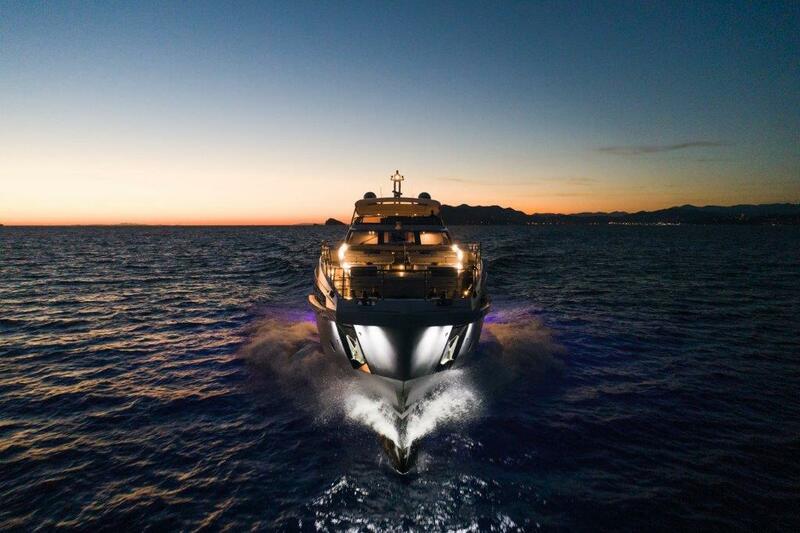 From a strong eld of entries, the judges selected a yacht they felt was the most visually inspiring and one that delivered a strong, cohesive profile consistent with its mission. Clean, spare lines and crisp window shapes up to and including the flybridge windscreen are nicely designed to show off a high contrast exterior colour scheme. The flybridge hardtop, while small, aesthetically and physically suits the profile of a fast yacht, which can hit a top speed of 26 knots and cruise at 23 knots. The judges were impressed by a well-presented design development package from renderings to finished photos that showed how the client was involved in the creation of a very personal family boat working from a semi-production platform. 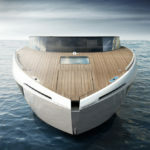 The design team also took into account the family’s request for long-term autonomy in all-important elements such as storage and extra refrigeration, not easy to accomplish in a 33 metre. Design elements to support the prime directives of relaxation, a contemporary beach house vibe and use of natural materials are consistent throughout the interior spaces. The treatment of oak to mimic the look of driftwood is particularly effective and pleasing. 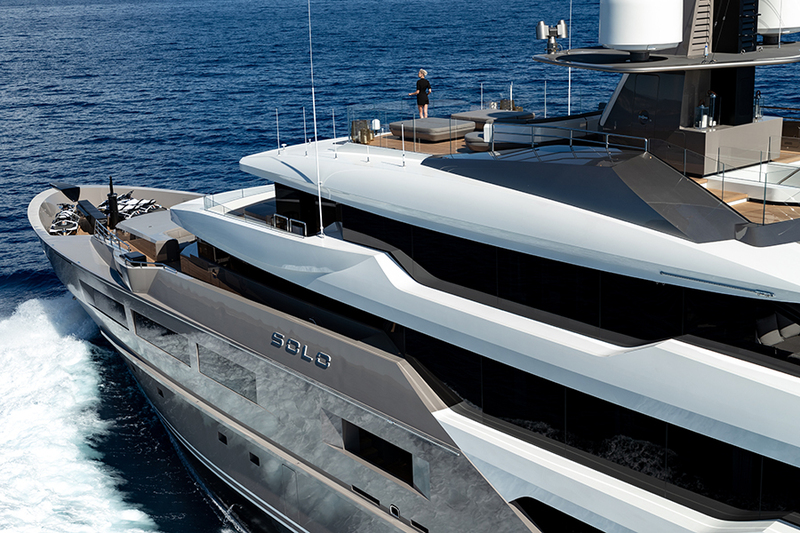 El Leo nboldly combines the look of an open yacht with the liveability of a displacement motor yacht. 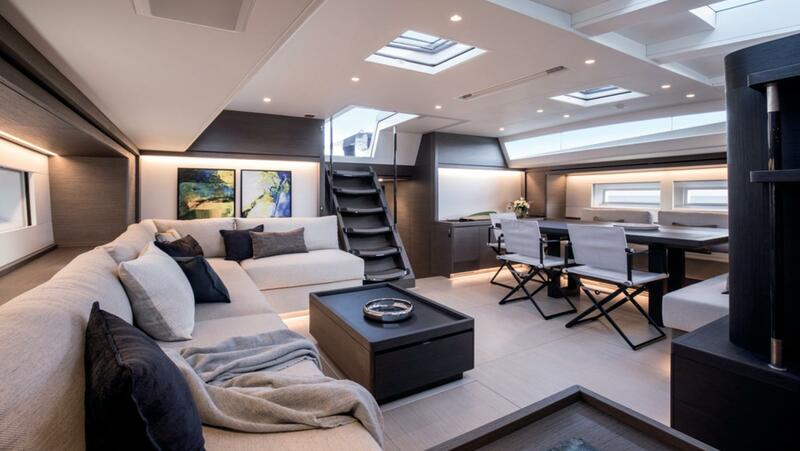 Features that distinguish this low, sleek boat such as floor-to-ceiling windows and a 2.6m saloon overhead height required clever solutions to hide the mechanisms of the luxury lifestyle such as air conditioning with fan coil units hidden in elegant freestanding furniture. Judges complimented the staircase surround that ties into the main deck lobby floor in a veneer waterfall effect and the innovative the use of a pliant new material borrowed from the automotive industry to light columns defining the entrance. It was developed for dashboards of luxury cars but Overmarine found a way to glue it into a semicircular plexiglass material. The result is simply stunning. While two warm and traditional interiors garnered the judges’ appreciation in this category, the very contemporary interior of Seatiusseized their votes. 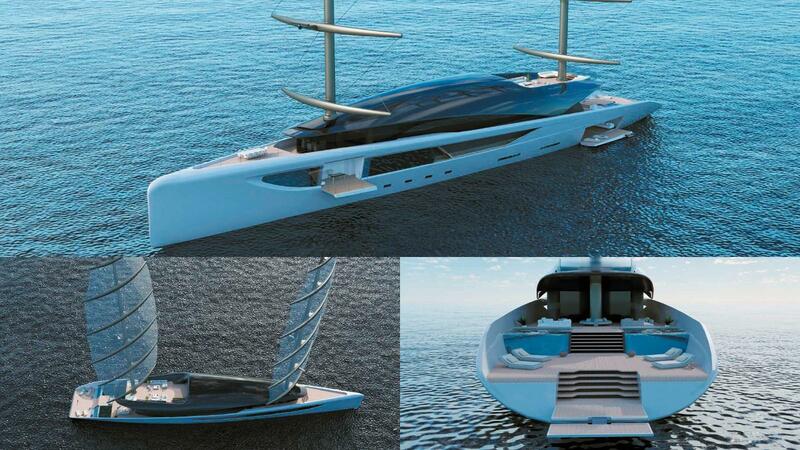 The yacht is fully customised for long distance cruising but at near performance-yacht speeds. 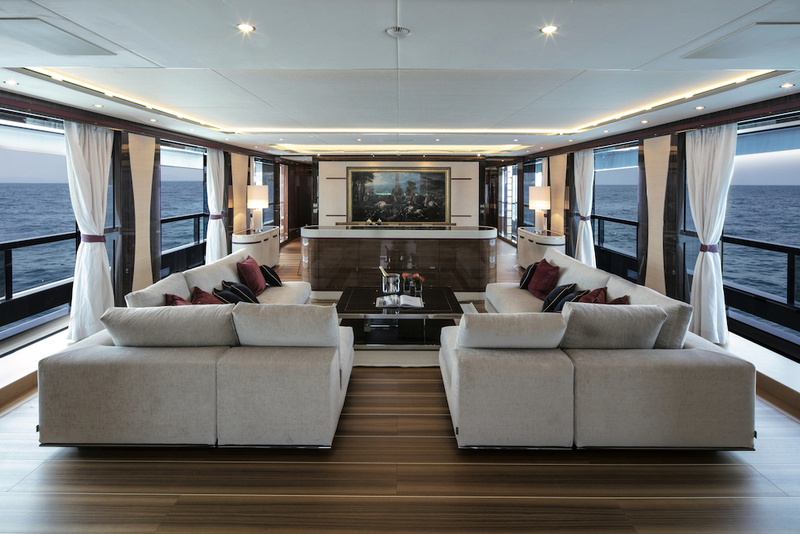 The elegant, lightweight interior gives nothing away in terms of luxury as elegant fabrics and suede highlight a predominantly two-tone, light and dark colour scheme with interior joinery of socially responsible, reconstituted wood veneer. Matching the exterior, the lines of the interior are crisp and clean but hardly minimalist as stepped surfaces and reveals add depth and interest. Using the darker joinery as an accent for overhead ventilation panels and updated crown moulding, which also hides ambient lighting, visually lengthens the rooms. Yachts in this category tend to be driven by market expectations when it comes to top speeds, but the various entries this year showed different approaches to developing efficiencies that would allow longer range or smaller engines or both. While the naval architecture subcommittee found plenty of good design, there was little runaway innovation. Interestingly, three yachts finished within two points of each other. What propelled the winner to the front of the pack was the documented effort Azimut made on several fronts, spending time and investment in CFD and model testing to improve trim and with a well-developed nite element analysis program, reduce weight in a yacht that is a scaled-down version of a previous model in the series. Extensive use of carbon fibre – the superstructure is made entirely of it – helps with the weight issue, allowing for more volume. The D2P (displacement to planing) hull with piercing bow meanwhile, is designed for efficiency at two speeds – the first from 11 to 12 knots and the second up to 20 knots, to optimise performance. 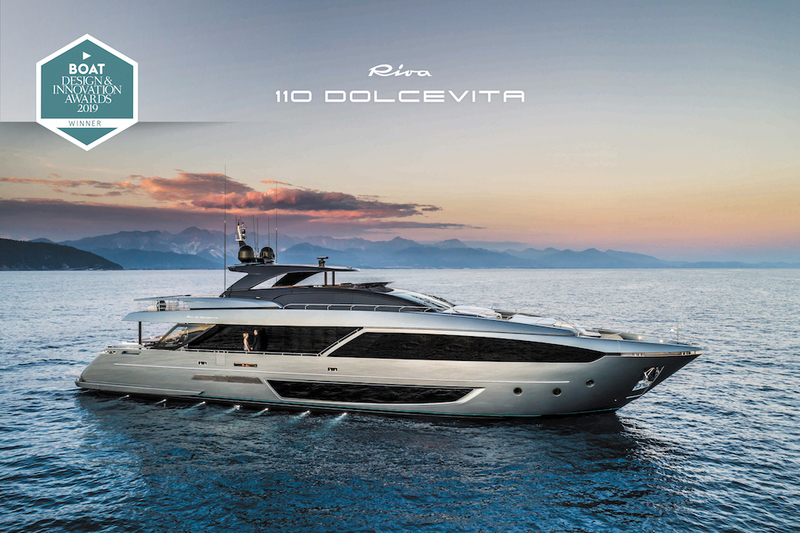 Presented to the best new series yacht, this category honours innovation, aesthetics, R&D and potential commercial appeal. 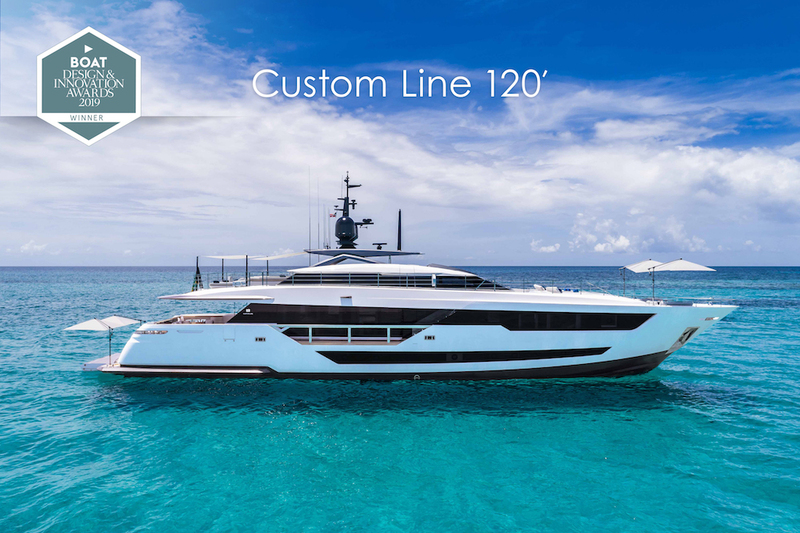 Ferretti Group tapped Francesco Paszkowski and Margherita Casprini to work with its Strategic Product Committee and engineers for a new flagship – the Custom Line 120 – focused on removing boundaries between interior and exterior. With styling cues from the automotive sector, the profile has a sleek, powerful look from single long window lines and a deeply notched bulwark. 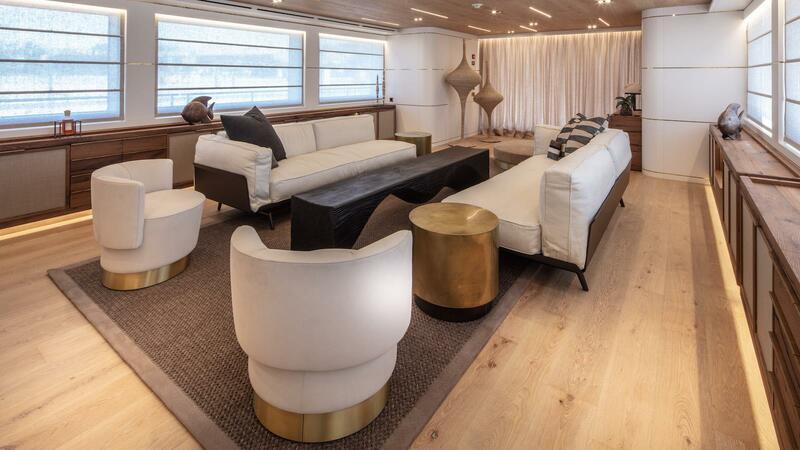 Ferretti Group innovated a glass aft bulkhead for the main saloon that either slides open like a regular door or lifts in one piece, storing in the aft deck overhead, totally opening the main deck from stern rail to the owner’s suite door. The vessel hits the performance mark as well, with a 25 knots top-end speed and 1,150nm range at 11 knots. Competitively priced among its peers, orders for sister ships were received in the model’s first season. This new category honours a product, process or technology that adds to the design and build sophistication or ease of use and owner enjoyment of a yacht. After much discussion, the judges decided the “clear winner” to be the various frameless curved structural glass bulwarks, walls and pool created at the request of an owner who wanted all of his views to be unbroken by frames or supports. Key to the success was Tankoa’s partnership with Italian glass manufacturer Viraver. Among the stand-outs of the installation are a 180-degree glass-walled winter garden, frameless laminated glass railings and bulwarks, a laminated glass balcony with glass-walled spa pool and the main deck’s seamless infinity pool with its rounded corners and glass-bottom skylights. Viraver’s new bending tools produced cylindrical glass shapes with no optical distortion or undulations. Viraver also expanded its chemical hardening facilities to accommodate larger pieces such as all of Solo’s main deck windows, which received class approval to remain uncovered by storm ports during crossings and a platform level glass door. It is often said that it’s quality, not quantity that really counts, but this year’s Young Designer of the Year competition had both. The task called for entrants to style and create the general arrangement plans for a modern, elegantly beautiful 80-metre motor sailer, the unstayed masts of which carry between 1,500 and 2,000 square metres of sail. 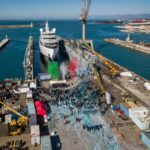 This challenge certainly caught the eye of many aspiring yacht designers, and 42 students submitted their designs – the highest number ever. Finally Yihharn Liu, from Taiwan, was declared the victor. The winning entry, entitled Manta, stood out for many reasons, including its accurate interpretation of the requirement, its cleanly elegant lines and a particularly well-developed and precisely drawn general arrangement plan.